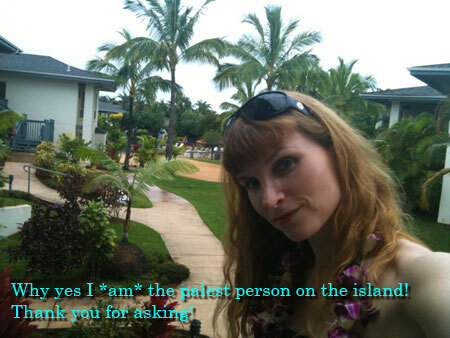 I am very happily writing this post from my hotel balcony overlooking one of the gorgeous beaches of Hawaii. Aloha! I’m usually a rather obsessive travel planner & will do weeks of research, reading, posting on forums before a trip, but this time I refrained completely. Part of that was just being swamped with work & a rather sudden & unexpected bout of apartment hunting, but I am really enjoying a holiday where relaxation is at the top of my TO DO list. We’ve been swimming, going for long walks, hanging out on the beach – all very mellow. I brought my snorkel gear with me & would be content doing nothing other than driving to different beaches every day to snorkel. The ocean is warm & the fish, at least down at Poi Pu, are amazing! Snorkeling where you can stand up & fix your mask at any given time is pretty great. Especially if you’re my dad & seem incapable of NOT breathing through your nose! Poor guy! With only a few days left, I’ll be back to work (& shipping out orders!) shortly. I wouldn’t say I’m homesick yet, but I am definitely missing the pug. I keep seeing people on the beach with their dogs & can’t help thinking how much the pug would LOVE chasing the chickens that are apparently Kuaii’s official bird. Now if only I could get him to take care of those pesky roosters that have ensured I don’t sleep in one single morning!